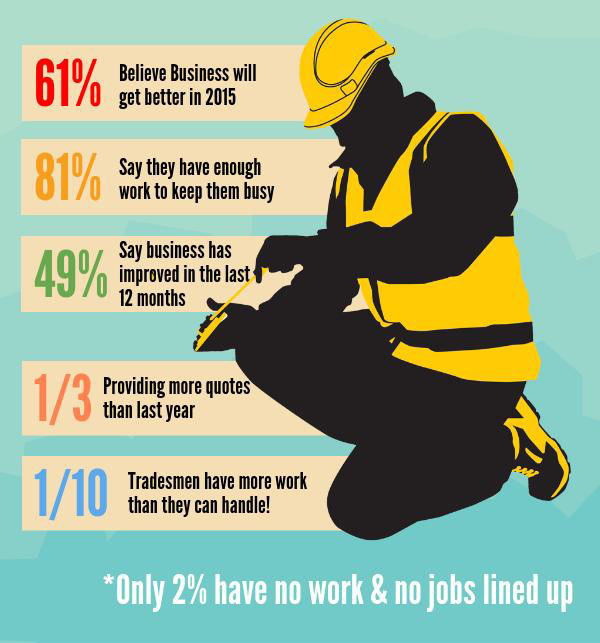 2015 is looking like a happy, busy new year for tradesmen in the UK. Qualified plumbers and heating engineers are among tradesmen who are working harder than ever. Many are expecting a big business boom over the next 12 months after new research was released by trade supplier, Plumbfix. As we approach the traditional “home improvement season”, homeowners seem to be more willing to spend a bit more cash on fixing things up. More calls are made to professionals to aid in home improvement projects that require more than just a DIY touch. Screwfix (Plumbfix’s umbrella organisation) asked a number of tradesmen, including plumbers, what their predictions would be in 2015. Well over half (61%) of all the plumbers and other tradesmen asked in the “Trade Pulse” report, expect business to get even better for them in the new year. More than 80% of the qualified engineers questioned, also said that they will have enough work to keep them busy. In comparison, only 73% of tradesmen questioned in 2012 felt that this was the case, a very positive sign that business for UK tradesmen is continuing to improve and grow. This positive outlook is backed up by the fact that more than 39% of tradesmen are providing more quotes for prospective jobs compared to this time last year. This is another trend which continues to improve each year. There are even a few (around one in ten) who already feel their current workload is more than they can handle. Tradesmen are also positive about the general economy, confident that it will continue to improve over the next 12 months. Whether this proves to be the case, we wouldn’t want to make any wild predictions at this stage! Trade Pulse is a monthly index which surveys more than 500 UK tradesmen including qualified plumbers and heating engineers and tracks work levels and optimism among the trade. Looking to save money and stay qualified?